Docker Sokoban download. Free download Sokoban game. 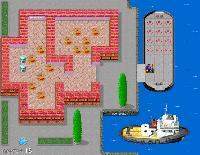 Docker Sokoban is a newest remake of a popular logic game Sokoban. This time you'll be playing a clever docker who is working hard at such places as the seaport, railroad or the warehouse. Download Sokoban for Windows and play it at home. Original innovations and high quality animated graphics will guarantee you and your children many hours of brain-bursting fun. Seems like it's very easy to operate, but maybe very difficult to solve. The point of the Docker Sokoban game is to move all of the objects (boxes, barrels etc) to marked with corresponding color floor positions. You can only push but not pull the objects. You can move docker around the maze by using arrow keys. If you have made a wrong move, you can easily undo it by pressing spacebar. In the full version of Docker Sokoban, you can press and hold CTRL+S at the very beginning of each level to see step-by-step solution for puzzle you're solving. We offer completely free version of Docker Sokoban. It is full version of Sokoban without any limitations. We have no player reviews for Docker Sokoban yet.